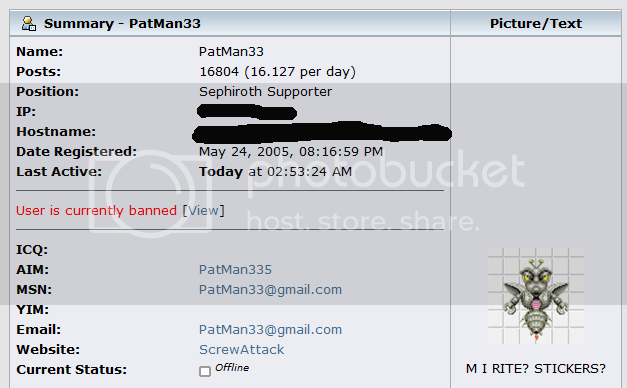 the forums still wont be the same. At least until tomorrow. He's gonna be angry when he gets back. So he's not gone for good? All bans are permanent. We tried temp-bans and they did not work. ...I'll believe it on April 2nd. Yeah, the timing and such...but I'll believe it on April 2nd. If actually true, and if possible I'd like to request a little more information, in a PM. I mean, I'm not going to act like I deserve an explanation...but I kind of feel like I deserve an explanation. The guy who started this topic just about a week and a half ago: http://www.gamingsteve.com/blab/index.php?topic=11782.msg502909#msg502909 ? The one who actually has a reminder to flag inappropriate posts in his signature? The man who LITERALLY tried writing the rules for chat rooms on this site? Here's my latest draft of the proposed rule to extend the forum rules over to the chats. If enacted it would become rule number eighteen. 18. Any and all chats (be it Gabbly, Yaplet, IRC, or what have you) that use the Gaming Steve URL (http://www.gamingsteve.com) and/or the Gaming Steve name fall under the jurisdiction of the Gaming Steve administrative staff and all of the rules set in place by the community. There are no exceptions to this rule however a more liberal policy is applied to language and subject matter. ..and If he was banned before you posted this why would his profile show him as coming on this afternoon? Of course I don't have all the information, which I would like to before I pass any final personal judgement on the matter. We made this public so we'll discuss it here. Yesterday he used a forbidden word and when Danzik changed his post, he got into an argument on the forum. Those posts were cleared away and the word has been added to the censor list. Later he was hostile to Danzik in IRC and to the rest of us by pm's and email, the final straw coming this morning in a threat. I don't know what got into him but we tried to salvage things with no luck. His profile might show he was on if he altered his cookies, it's happened before with others who were banned trying to sneak back on. Again, not something we normally do but since this is a rare case, here is your proof. I'm sorry, it was not an easy thing to do. Also, please stop with the spam posting. Type in readable English or not at all. Sigh. I'll go so far as to say certain words should never be used in conversation, especially on this forum. While I understand that the it's recently become popular due to that internet meme, but, rules are rules and certain things just can't be taken back. Oh... I remember now. He used the bad word that rhymes with "Ijjin"